SYSTEM KIT 1 is for anyone suffering from bald patches, intensive hair loss or new mums experiencing hair thinning and loss after childbirth. Incorporates the latest technology resulting from extensive capillary research. Designed to provide a deep intensive action on the root and the hairs erection system through a combination of revitalisers, vitamin groups B, E and H, amino acids, enzymes and an effective high protein complex. The Science Control Hair Loss Treatment is especially suited to anyone who is experiencing minimal capillary activity, and is suffering from intense hair loss. Trace Elements – Copper, Zinc, Magnesium, Iron. Biotin, Vitamin B1, B2, B5, B6, B8, B12, Vitamins E and H, Amino acids, Thymus extract. Developed specially for hair that is weak and those prone to hair loss. It provides strength, volume and force thanks to its multivitamin essential complex, incorporating the most vital vitamins for hair: A, B2, B5, B6, B12, C, E, F, H, and PP. Prevention hair loss shampoo contains essential trace elements that have a powerful action on the hair follicle metabolism, which enables and enhances microcirculation of the scalp preventing premature capillary ageing and baldness. Formulated specifically for anyone showing signs of devitalised hair or with obvious alopecia problems. Hair Nutrients Royal Jelly Shampoo incorporates an essential multivitamin complex, to provide, strength and volume. It prevents premature capillary ageing whilst encouraging hair growth. Royal Jelly, Citric acid, Biotin, Keratin amino acids, Multivitamins, Horsetail, CEGABA. 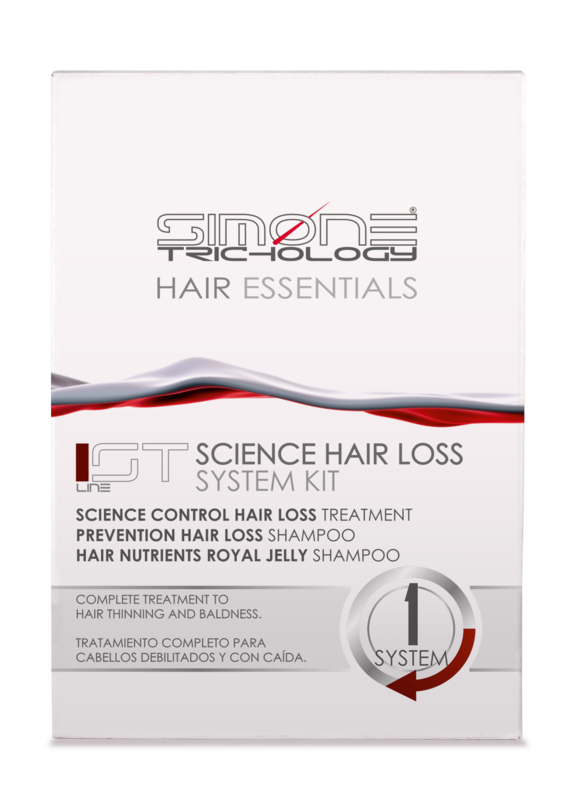 Apply SIMONE TRICHOLOGY SCIENCE CONTROL HAIR LOSS up to 7 times per week after washing the hair thoroughly with PREVENTION HAIR LOSS SHAMPOO and HAIR ́S NUTRIENTS ROYAL JELLY SHAMPOO. System kit 1 should be used for a minimum of 12 weeks. SYSTEM KIT 2 stops hair loss in 10 days. It has been developed for anyone suffering from seasonal or eventual hair loss. It enhances the microcirculation of the scalp and stimulates hair follicles. This treatment stimulates the production of new cells in the hair matrix, and regulates hair production in difficult cases where there is minimal possibility of recovering growth, especially where definitive hair loss is apparent. Trace Elements – Copper, Zinc, Magnesium, Iron. Biotin, Vitamin A, E, B Vitamins, DNA, Saponaria officinalis, Amino acid. Apply SIMONE TRICHOLOGY DX2 DIXIDOC TREATMENT up to 7 times per week after washing the hair thoroughly with PREVENTION HAIR LOSS SHAMPOO and HAIR ́S NUTRIENTS ROYAL JELLY SHAMPOO. System kit 2 should be used for a minimum of 12 weeks. SYSTEM 3 AGA HAIR LOSS SYSTEM KIT SYSTEM KIT 3 is suitable for individuals who are suffering from cellular malformation and degeneration of the papilla and hair matrix, such as Androgenic Alopecia (AGA), alopecia’s and hair loss. AGA HAIR LOSS TREATMENT contains an advanced amino-peptide complex from embryonic tissue prepared by an enzymatic technique. The AGA system is SIMONE TRICHOLOGY’S most advanced capillary regeneration and prevention treatment. Trace Elements – Copper, Zinc, Magnesium, Iron. Vitamin complex, Amino- peptide complex. Multivitamins, Amino acids, Hydrolysed keratin, Placental extract, Citric acid, PABA. Apply SIMONE TRICHOLOGY AGA HAIR LOSS TREATMENT up to 7 times per week after washing the hair thoroughly with PREVENTION HAIR LOSS SHAMPOO and HAIR ́S NUTRIENTS ROYAL JELLY SHAMPOO. System kit 3 should be used for a minimum of 12 weeks. SYSTEM KIT 4 is for anyone suffering from oily scalp, greasy dandruff, redness, itching and flaking. This kit is effective at regulating excess sebum production. The NATURAL POLYPLANT SEBUM CONTROL SERUM treats conditions such as oily scalp, greasy dandruff, redness, itching and flaking. It is effective at regulating excess sebum production and deeply cleanses the scalp leaving it feeling clean and fresh. Results are usually seen within days of using this treatment. Rosemary, Thyme, Horsetail, Hazel, Burdock, Marigold, Centaurium Erythraea, Juniper, Witch Hazel, Chamomile, Sage, Nettle. The SEBUM REGULATING SHAMPOO has been formulated for any kind of hair affected by seborrhoea problems or greasy dandruff. It eliminates scales, eases itching and regulates sebum production, creating the ideal foundation for healthy hair. Citric acid, Tioxolone, Magnesium Chloride. TP OXYGEN EQUILIBRIUM SHAMPOO is suitable for all types of hair and scalp conditions. The key ingredient ATP is a source of essential energy for hair follicles, stimulating hair growth, whilst preventing premature capillary ageing. This shampoo is effective at removing impurities, balancing the scalp and hair, leaving it feeling soft and manageable. Adenosine Triphosphate (ATP), Vitamin B15, Aloe Vera, Lemon. Apply NATURAL POLYPLANT SEBUM CONTROL treatment up to 3 times per week after washing the hair thoroughly with SEBUM REGULATING SHAMPOO and ATP OXYGEN EQUILIBRIUM SHAMPOO. System kit 4 should be used for a minimum of 12 weeks. SYSTEM KIT 5 is a complete kit for anyone suffering from dry or greasy dandruff, with possible itching and redness of the scalp..
NATURAL POLYPLANT ANTI-DANDRUFF treatment prevents itching and flaking associated with dandruff. It cleans, soothes and regulates the production of sebum. Regular use will enhance hair strength from root to hair bulb, especially weak hairs that are prone to split ends. Rosemary, Arnica Montana, Horsetail, Menthol, Piroctone olamine, Caster Oil. DANDRUFF AND SCALP CARE SHAMPOO address two problems for hair that is affected by both dry and greasy dandruff. It contains a long life anti-dandruff agent to impede the rebound effect normally associated when treating this type of condition. This shampoo will leave hair feeling clean, refreshed, invigorated and most importantly dandruff free. Menthol, Citric acid, Faex extract, Piroctone olamine. Apply SIMONE TRICHOLOGY NATURAL POLYPLANT ANTI-DANDRUFF treatment up to 3 times per week after washing the hair thoroughly with SEBUM REGULATING SHAMPOO and DANDRUFF AND SCALP CARE SHAMPOO. System kit 5 should be used for a minimum of 12 weeks. SYSTEM KIT 6 is a complete treatment for anyone suffering with sensitivity of the scalp, including dryness, redness and itching. Or for anyone who has damaged hair. KERATIN MOLECULAR RESTRUCTURING treatment has been developed for anyone who is suffering from itching and redness of the scalp and cuticle, cortex damage that has been caused by improper use of chemicals, heat, and environmental factors such as UV sun exposure or salt water. Hydrolyzed collagen, Glycolic acid, Lactic acid, Malic acid, Tartaric acid, Citric acid. The NUTRI FIBER MOISTURIZING SHAMPOO contains a high concentration of moisturising actives and humectants that prevent the hair from losing its original water levels, contributing to hydration to return thickness and natural sheen to the hair. It gently removes impurities and will naturally rebalance sensitive, dry, flaky scalps. This shampoo works to prevent premature capillary ageing whilst leaving the hair feeling soft and manageable. Hydrolyzed collagen, Citric acid, Magnesium chloride. 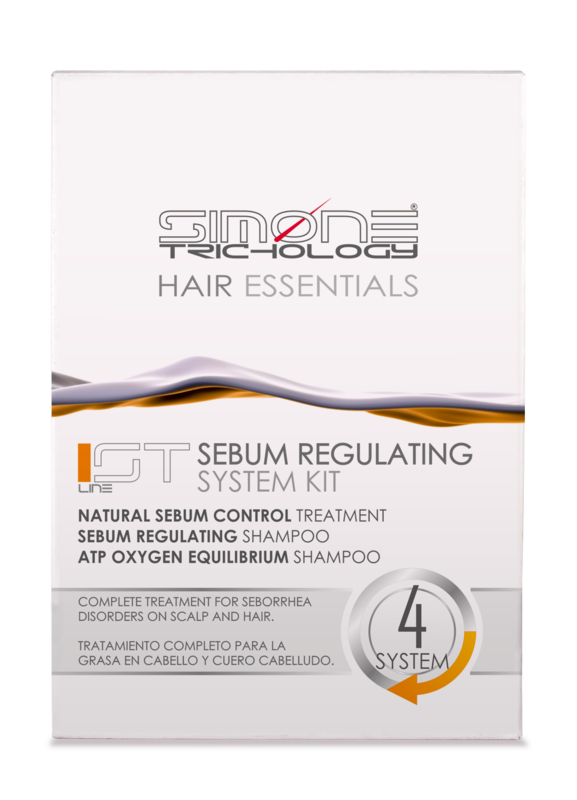 ATP OXYGEN EQUILIBRIUM SHAMPOO is suitable for all types of hair and scalp conditions. The key ingredient ATP is a source of essential energy for hair follicles, stimulating hair growth, whilst preventing premature capillary ageing. This shampoo is effective at removing impurities, balancing the scalp and hair, leaving it feeling soft and manageable. Apply KERATIN MOLECULAR RESTRUCTURING treatment after washing the hair with NUTRI-FIBER MOISTURIZING SHAMPOO and ATP OXYGEN EQUILIBRIUM SHAMPOO. Massage in circles using fingertips from the scalp to the hair tips. System kit 6 should be used for a minimum of 12 weeks.